NOTICE: In June 2003, a special, print version of this page, as it then was, beautifully framed, was presented by your webmaster on behalf of our class and the Oceanside Chamber of Commerce to Nathan's Oceanside. Click here for details and photos. This song's cooler than that Perry Como hot dog song, isn't it? As most visitors to this site will surely agree, the de facto center of our little town in the late 1950s and before, at least socially, was not the town triangle, but most certainly it was a little further south on Long Beach Road — at Weidner Avenue. 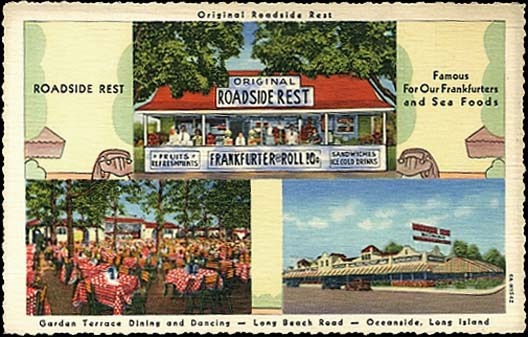 For many, many people, whether they were local residents or not, the famous Roadside Rest (which became Roadside Rest in 1959) provided them with some of the fondest memories they have of Oceanside. 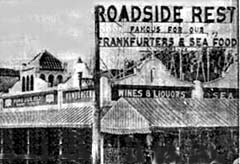 Since the 1920s, the Roadside Rest was a huge part of our little town's history and culture, its most famous business and its most recognized landmark. More than anything else (except maybe the Shrine of St. Anthony, the world famous underground Catholic church built in 1928 and destroyed by fire in 1960), the Roadside Rest put our little town "on the map" (as said in one of our reunion speeches, these were the two — yes two — renowned "religious shrines" in our little town). And for the many of us who came to Oceanside in the early to mid-1950s from Brooklyn, going to Famous was, in many ways, like taking a nostalgic trip back home. 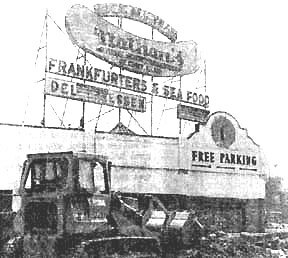 According to a 1976 article by popular columnist, Jack Altschul, Long Beach Road was "a dusty, two-lane thoroughfare that connected Long Beach and Rockville Centre," and "Oceanside was a clamdigger's hamlet in between and hardly a location one would project as the site of a bonanza." But the Roadside Rest soon became primarily a hot dog stand and one of the countless imitators (mentioned in the Denver Post article, below) of Famous, a Coney Island landmark since 1916. As reporter, Jack Altschul, also wrote in that 1976 article about the Roadside Rest, "A year or two after they located on Long Beach Road, the partners decided to install a small grill for frankfurters and a spigot or two to dispense drinks. They had noticed a marked increase in automobile traffic to Long Beach and counted on a few of the beach-bound travelers to stop at their stand for refreshments. The demand for the all-beef frankfurters was to so far surpass their expectations that they spent much of the decade enlarging their premises ... [to] a one block-square piece of property, with a counter exceeding 100 feet in length and an 80-foot bar in a wood-paneled dining room off the street." These three clustered photos seem to be the oldest ones available of the Roadside Rest building that we knew when we were kids. Notice at left that the famous sign above the northwest and southwest corners of the building (as shown above in the photo from the early 1930s) had not yet been erected. competition right across the street during the mid-1930s. 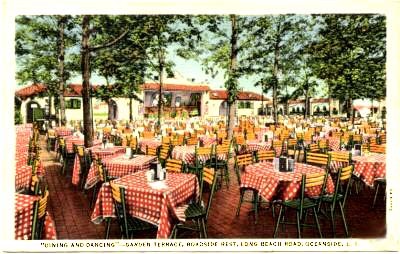 In the mid-late '30s and early '40s, the Roadside Rest, which called itself "Long Island's famous family rendezvous," was very popular for its frankfurters and seafood (seafood was not introduced by in Coney Island until 1946) and its outdoor entertainment (live band music and dancing) featured all year 'round on its "garden terrace" or "open-air pavilion." It claimed capacity to seat 3,000 people, and it occupied a full city block. Bill Handwerker wrote in his 2016 book, "My mother and father would tell me stories about how the big-band greats ... who would play regularly on the Roadside Rest's stage." According to an account written in 1974 by another reporter, Dennis Weintraub, "The small place grew from hot dogs and hamburgers to the heights of a well-known supper club and peaked, says Morton Shor, around 1940. ... It featured the legendary big bands led by Tommy Dorsey, Benny Goodman, Eddy Duchin, and Lionel Hampton. There were nightly [radio] broadcasts of the bands' concerts and dancing under the stars." "It was a grand and glorious era, a wondrous time that gave me many, many fond memories. In fact, not a week goes by today when I don't meet someone who speaks fondly of his or her memories of that place," as told directly to this reporter in an interview in 2004 by 81-year old Morton (Morty) Shor, son of Roadside Rest co-founder, Leon Shor. Click here for a more extensive and detailed early history of the Roadside Rest, including Morty Shor's unique perspective obtained in exclusive interviews of Shor conducted for this website on January 4, 2004, and again in December 2010 and June 2015, when he was 81 and almost 88 and 93 years old, respectively. 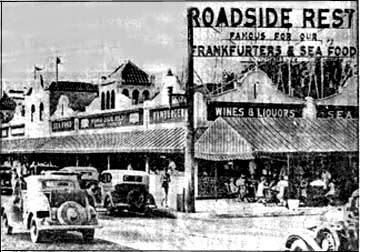 Also featured on the same page are images of various items of early Roadside Rest memorabilia and photos of its little known branch locations in Merrick and Miami Beach. The Roadside Rest's garden terrace often featured Harry James' orchestra, Gene Krupa and many Dixieland bands, too. In the summer, it attracted many people who drove there from Brooklyn and Queens (probably in their very first cars) to escape the hot and crowded city, or stopped on their way home from a day at Long Beach or Jones Beach. However, beginning in early 1942, World War II brought gasoline rations with highly curtailed pleasure driving and the demise of the big swing bands (all the young musicians were drafted, as were half of most young dancing couples). By the mid-'40s and early '50s, there were no longer any big bands, nor was there other live music or dancing offered any more at the Roadside Rest. And with the introduction of air conditioning (in movie theatres and later in homes) and TV, the growing traffic congestion between NY and LI followed by the effects of WWII reducing both recreational automobile use and the availability of live, big band entertainment, the old Roadside Rest lost its popularity and became run down, eventually, it actually closed briefly around 1955-'56. THE ROADSIDE REST'S gay, romantic atmosphere, fascinating dance music, and delicious food, well served, constitute it as one of the outstanding places for pleasure-lovers. Here you may dine and dance in The Garden Terrace, a veritable paradise under the stars or in the splendor of the Old English Tavern. Parking for over 2,500 cars. Open all year. This bright spot caters to the millions. Of course, we know that Famous, the original in Coney Island, practically invented, and virtually single-handedly popularized, the American hot dog on a bun — with mustard and sauerkraut beginning in 1916— and until WWII, for only a nickel!! Nathan's Famous in Coney Island. Murray Handwerker tried to convince his father, Nathan (the Nathan of Famous), to risk taking his hot dog emporium beyond the close boundaries of his comfort zone of over 40 years — Coney Island, New York. According to a interview, June 11, 1976, Murray said, "Dad, people are moving out of Brooklyn to the suburbs, and our customers, too." And as Nathan's grandson, Lloyd Handwerker, quoted in his 2016 book, Famous Nathan, Murray told Nathan, "Times have changed. You've got to grow, and you've got to do different things." Nathan, however, was unwilling to do it at first. He felt he could only watch one "store," as he called it, at a time. So in late 1956, Murray acquired title to the famous Roadside Rest property, through a corporation he controlled, refurbished it and then took over its management by himself in January 1957, according to an article in the , and operated it under its original name (or as Murray's son, Bill, says in his book, as "Murray's Roadside Rest" ). Next door, there was an area with amusement rides for little kids called "Kiddieland Park" (later to become "JazzboLand"). Whatever the reality, on Thursday, June 4, 1959, our beloved Roadside Rest opened as Roadside Rest and became what it had previously imitated. At first, the new was managed by Murray's younger brother, Sol, while Murray went back to Brooklyn. However, after Murray returned, the old name, Roadside Rest, was quietly dropped forever (except, of course, from our collective sweet memories). The June 1959 grand opening of Famous Roadside Rest must have been one the grandest events ever in our little town. In addition to the ads taken in Newsday and the Oceanside Beacon (displayed above and below, respectively, on this page), the event was announced briefly as news in the New York Post (see the clipping reproduced at right). 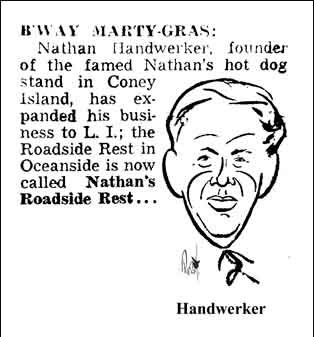 The Post announcement featured a caricature of the famous face of Nathan's founder, Nathan Handwerker, created especially for the occasion by ong-term (1950-1977), famed Post editorial and sports cartoonist, John Pierotti. The original of this work hangs in the home of Nathan's grandson, Bill Handwerker, author of Nathan's Famous: The First 100 Years, and previously hung in the company's offices in Coney Island. (Click here or on the caricature at right for a larger image of the original.) Except when it appeared in the notice in the Post, the image has never before been seen publicly, either printed in any book or by online display. "I believe I went with Joel [Pravda]. They were giving free franks, but only two at a time. I think I was happy with two, but I can't swear for Joel. It was a mob scene!" "I recall the day that Nathan’s took over the Roadside Rest; they gave away free hot dogs without limit. They imported some guys from the Brooklyn establishment who had incredibly fast hands. I remember marveling at how fast they filled buns with hot dogs, (and wondered how cooked the dogs they served were). "I was taking driver’s ed. at the time, and one of the coaches was the driver’s ed. teacher. The whole carload of students voted unanimously for a student drive which would take us past Nathan's, though it was a morning class. The teacher didn’t protest too much when we pulled up and parked. We went in and ate our fill. "At lunch. a bunch of people, me included, went again and I had another three, or four, who can remember? After school, we went again, but I think I could only get down two. "Where do you think we went for supper when my dad got home from work? "It was a few weeks before I could look again at another hot dog." In 1961, the "Kiddieland Park" area was taken over by Jazzbo, a professional clown who operated it until 1965, and it was renamed "JazzboLand." Jazzbo appeared there regularly. 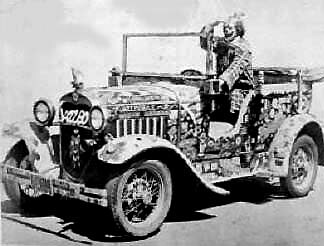 For years before that (1947-1960), we saw him in our annual Memorial Day parades and other local events usually with his colorful clown car, a 1930 Model A Ford known as the "JAZZMOBILE" Do you remember? In addition to hot dogs, our Oceanside (the second one on the planet) served up a wide variety of foods that was virtually unheard of (except in Coney Island). The choices offered included pizza, corn-on-the-cob and stuff that you could not buy standing up almost anywhere else, such as lobster and shrimp rolls, clams-on-the-half-shell, "Ipswich" fried clams, chow mein on a bun and frog's legs (yes, frog's legs). It was just like the original in Coney Island — only better — at our , you could always sit down to eat — and drink! familiar to us, such as Joseph's Hamburgers, Wetson's (which acquired in 1975) and the original fast food hamburger chain (started in 1921), (which was in Lynbrook). At , you had to wait on a different line for each item you bought, including the drinks (so in that respect, it certainly was NOT fast food). Every member of your party was assigned a different line to wait on. "I spent many hours of my youth in this old building, which had an outdoor dance floor and once hosted big bands. The wisdom of the location can be seen on a map of Long Island, east of Idlewild Airport, now known as JFK. 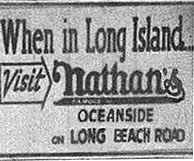 Nathan's was located on Long Beach Road — the major thoroughfare to and from Long Beach2 — the summer resort of literary renown with a miles-long, elevated boardwalk full of beachfront hotels, kiddie rides, game arcades, and knish vendors; a credible rival to Atlantic City, NJ." "Frog's legs, pizza, clams, oysters (in season), burgers, franks, shrimp rolls, chow mein on a bun, deli sandwiches, pea soup, clam chowder, shrimp, soft and hard ice cream and, of course, their famous fries. Did I leave anything out?3 I cooked and served most of the above as a part-timer in my HS/college days. What a great place for a hyper-hormonal teenage guy to work at. Every gorgeous gal in town passed through going or coming back from the beach.4 In cooperation with the Oceanside Recreation Department, they had puppet shows and concerts on the stage in back." Well, Rick, some remember knishes, too. (But who would eat a knish at Nathan's when they had such great fries, and the best knishes were at Izzy's on the Long Beach boardwalk?) And our classmate, Ed Chilton, adds, "Yep. There was a 4-foot by 3-foot tray of ice, and on top of the ice were slices of watermelon and cantaloupe, and fresh fruit, e.g., grapefruit, pineapple slices, etc." Like Rick, for so many of us, as kids, it was also a great source of part-time jobs. Although, as kids tend to do, we took it for granted at the time (like our school, our little town and even our music), we now realize that our was really special — and that it was really ours! "The huge building with picnic-style tables became a destination: to go after high-school football games, after a day at the beach, to celebrate when you first got your drivers' license, or just to people-watch and meet kids from other towns." 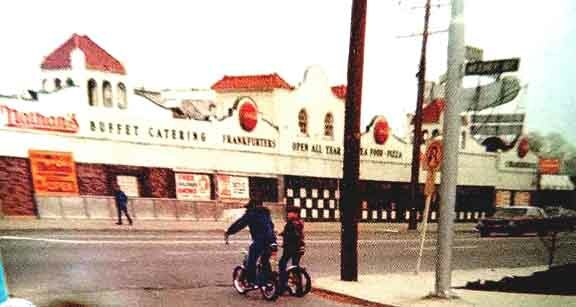 The north and west sides, as our Nathan's Famous, looked when we were kids. 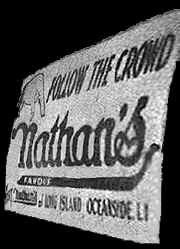 This photo courtesy of Nathan's Famous Inc.
Interestingly, the photo above was dug out of the archives by Nathan's Famous, Inc.'s corporate office after a year-long search made for this site at our request and then (in its original full color form) and is still the only photo (not Coney Island) featured on the company's own website's very brief history page. In the early 1960s, a roof (photo below) was added over the garden terrace to get more use out of it during the cold months, and for a few years, entertainment was offered there again, but then the bandstand went silent. There were children's puppet shows, though, and bikers' nights. In 1966 (after opening its third location in the property previously known as the Adventurer's Inn in Yonkers, New York), celebrated its golden anniversary. 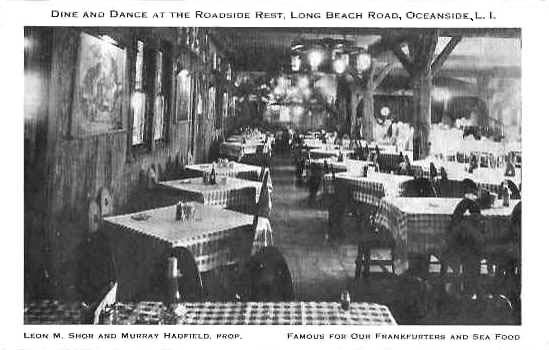 In 1971, Murray made another attempt at a rebirth of the glory of the former Roadside Rest in Oceanside as an entertainment facility. This time, the bandstand featured banjos, sing-alongs and jazz music, square dancing was introduced, and the puppet shows and the kiddie park continued. But, alas, nothing Murray could do could bring back the glory days of the big bands. 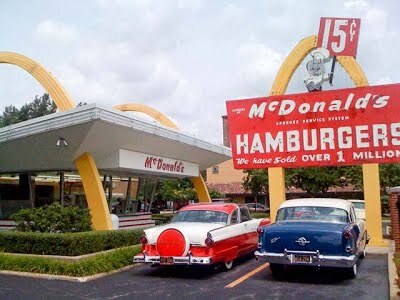 By 1976, the 47-year old structure we all loved was deteriorating and no longer well-suited to modern service of fast food, and the competition was growing. And so, sadly for us, on June 10th-11th, 1976, our beloved Famous Roadside Rest, which we all took for granted as kids, was demolished. 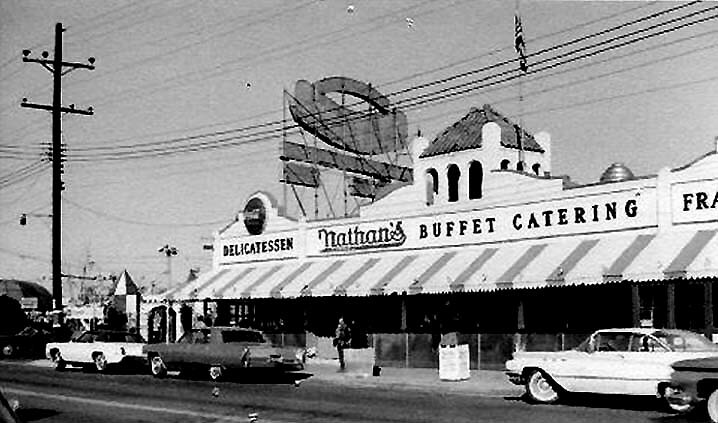 At left and below is how our Oceanside Nathan's looked (the north and west sides), without awnings, just days before it was torn down in 1976. 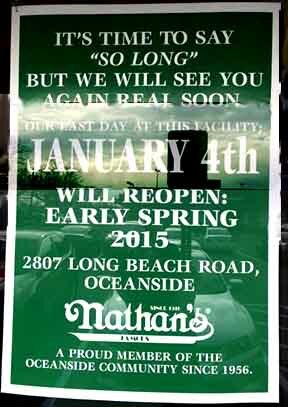 "It was like reading the obit of an old friend, the story about the demolition of Nathan's Famous in Oceanside to make room for a parking lot." It should have been protected as a historic site. Nathan's Famous for Health Food? In an article dated February 14, 2003, Newsday reported the death of a woman who was believed quite likely to have been the oldest woman in the world at age 119 and who lived most of her life right down the street in Long Beach and then Island Park. In the article, her 60 year-old grandson was quoted as saying "... her favorite place to eat was Nathan's," where she had lunch every Sunday. Substantially all of the contents of our page, as it was in 2003, in a beautifully framed, printed edition in the Oceanside , immortalizing the old Roadside Rest along with the Class of 1960, was presented June 28th of that year, on our behalf our class with the Oceanside Chamber of Commerce, who then declared June to be " Month in Oceanside, New York." (Click here for details and photos.) It hung at that location at the corner of Long Beach Rd. and Windsor Parkway until that location closed in January 2015. In late 2014, it was announced that the Windsor Parkway location was to close. Among some controversy among local residents, a new Oceanside location further north at 2807 Long Beach Rd. (corner of Merle Ave.) was approved and opened in March 2015. Below is a photograph taken circa 1959 of the original, but expanded, Coney Island (not nearly as pretty as ours but, nevertheless, quite a place). Notice the sign containing the large clock just to the right of center, and the one just to the right of that (also see close-ups, below); they are both promoting its then brand new second location — in our little town — Oceanside. Click here for our exclusive interview with Morty Shor, son of Roadside Rest co-founder, Leon Shor. Click here for our exclusive interview with the man most responsible for bringing to Oceanside and most closely associated with it, Murray Handwerker, son of founder, Nathan Handwerker. Click here for details and photos of the Class of 1960's tribute presentation to , June 2003, and links to related pages, including an article from the Oceanside Chamber of Commerce Newsletter about our class' tribute presentation and a letter of thanks to our class from . Click here for photos of your classmates at the "new" Oceanside taken the day before our 40-year reunion in July 2000. 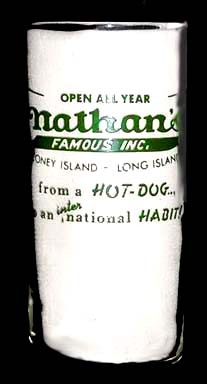 Click here for more on the history of Nathan's Famous in Coney Island and the company, Nathan's Famous, Inc.
Click here for more information on the history of our little town. 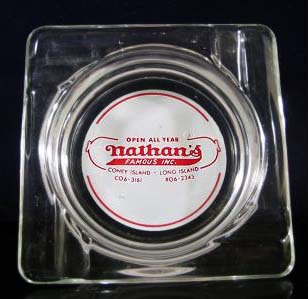 Commemorate the 100th Anniversary of the Original Nathan's FAMOUS! On October 16. 2015, we received a call from Bill Handwerker, a grandson of Nathan (founder of Nathan's Famous) and son of Murray Handwerker, who turned our renowned Roadside Rest into the Nathan's that we loved. Bill has written a book (along with co-author, Jayne A. Pearl), which is available from Amazon and elsewhere, called Nathan's Famous: The First 100 Years. (You can read about it on on Facebook.) The purpose of the call was to request permission to credit our class association and www.1960sailors.net in the book. 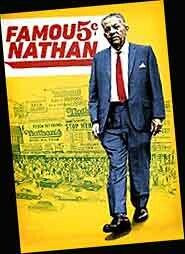 A second Nathan's history book, called Famous Nathan, also refers to this website and is available from Amazon. It was written (with co-author, Gil Reavill) by another Nathan Handwerker grandson, Lloyd Handwerker, (who, in 2014, also produced and directed an acclaimed documentary film by the same title). One hundred years ago, in 1916, an enterprising, bright and savvy, but uneducated, young Polish immigrant, started a modest business that would eventually grow to become one of the most popular and beloved food service establishments in the world — and one of the most famous — Nathan’s Famous, that is. 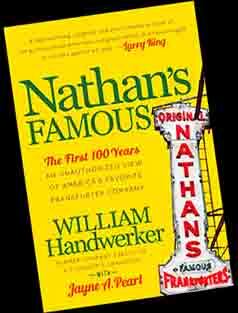 To commemorate the 100th anniversary of this iconic American family business, in the summer of 2016, two grandsons of its colorful founder Nathan Handwerker (whom I call “the Henry Ford of the American Hot Dog"), independently published books in loving tribute to Nathan and the company. For those from Brooklyn, Nathan’s Famous is, perhaps, second in its nostalgic value only to Ebbets Field (except that Ebbets Field has been gone for almost 60 years, and Nathan’s Famous is still there). 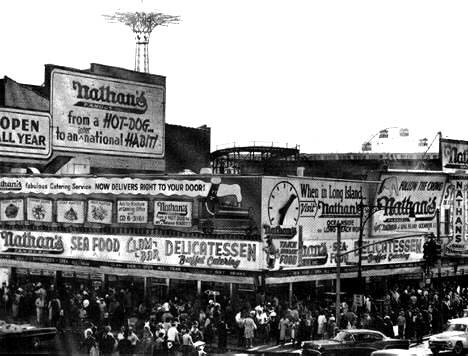 These two books are titled, respectively, Nathan's Famous: The First 100 Years of America's Favorite Frankfurter Company and Famous Nathan: A Family Saga of Coney Island, the American Dream, and the Search for the Perfect Hot Dog. Each from their own separate point of view, both books palpably oozing with family pride, the authors, first cousins, William and Lloyd Handwerker, poignantly tell the classic rags-to-riches story in most readable, moving, and delightful ways, of their poor, immigrant, illiterate but remarkable grandfather, and how he overcame all the conflicts and other obstacles frequently associated with family businesses, as well as two world wars, the Great Depression and all the other economic upheavals that occurred over the first 55 years of Nathan’s Famous — until Nathan retired reluctantly in 1971, three years before he died at age 81. 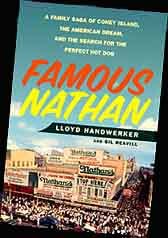 As I started reading the first available of the two books, Bill Handwerker’s, on the day before the popular annual Nathan’s Fourth of July Hot Dog Eating Contest in Coney Island, I instantly developed a craving for one of those fantastic hot dogs. We had them for dinner that night. Both accounts tell substantially the whole story and, accordingly, they overlap considerably, especially to the extent the text relies on a 1973 taped interview of Nathan made shortly before he died by another cousin of the authors, David Sternshein. However, they also complement each other well. Lloyd’s book, based largely on recorded interviews of family members and other long-term employees of Nathan’s Famous, delves deeper than Bill’s into his grandfather’s early life in poverty in Poland, his struggles as a young immigrant and a novice entrepreneur in New York City and the early history of the business. Bill’s book is more of a personal memoir that focuses mainly on the history of the mature business by the beach and beyond, most particularly the period when he worked there. They both emphasize and deeply explore the dynamics of running a family business when family members with strong personalities have divergent ideas about how to do it. For anyone who has an emotional, nostalgic attachment to Nathan’s Famous, or an interest either in the challenges and triumphs of America’s early twentieth century immigrants from Europe or a case study in managing a family business, I highly recommend reading both of these books. Never before has this story been told as intimately, passionately, completely and engagingly as in these two labors of love. And you just can’t make this stuff up. The ash tray and tumbler illustrated below were acquired in eBay auctions in 2003. Both are from sometime between 1959 and 1965, when there were still only two Nathan's locations, Coney Island and Oceanside. (The familiar green waxed paper drink cups shown above are also from the early days of Oceanside when there were only two Nathan's.) 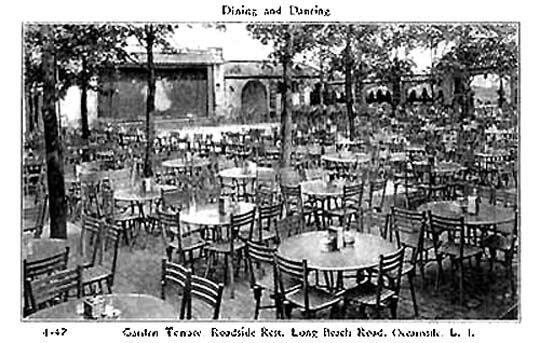 Most likely, the ash tray was used at the Oceanside location since there was only a very small dining room with limited seating at Coney Island, and probably for a short time only. According to Murray Handwerker, the tumbler was given away to as a souvenir to promote the 1959 grand opening of Oceanside but never actually used at the restaurants. in the Denver Post, November 15,1999. "Nathan's is entwined in the folklore of New York City and, more specifically, Coney Island. So much so that the video version of Roger Kahn's 'Boys of Summer' — about the fabled baseball Brooklyn Dodgers in the '50s —begins with narrator and comedian Sid Caeser [sic] standing in front of the Nathan's at Coney Island, eating a hot dog. "The hot dog didn't appear in America until the St. Louis World's Fair of 1904. 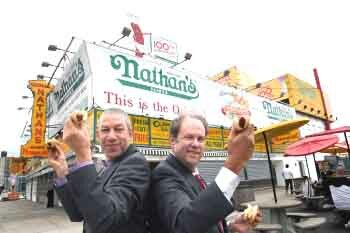 A dozen years later, entrepreneur Nathan Handwerker opened the first Nathan's hot dog stand on Coney Island's Surf Avenue, a block from the beach. "Handwerker was a potato-peeler at Feltman's, a white-tablecloth eatery a few blocks away. 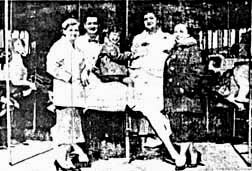 Feltman's sold hot dogs for 10 cents; a stiff price at the time. "As explained by Nathan's President and Chief Executive Officer Wayne Norbitz - a 25-year company veteran who himself started work behind a Nathan's counter — Handwerker borrowed $300 from a Feltman's piano player and a singing waiter. Their names were Eddie Cantor and Jimmy Durante. Both went on to bigger things in vaudeville, radio and TV. "Using a 'secret-spice' formula developed by his wife, Ida, Handwerker sold an all-beef hot dog whose unique taste depended on just the right amount of garlic. "Nathan Handwerker's hot dogs were a hit and spawned many imitators. Four years later, when New York subway lines reached Coney Island in 1920 with a large station across Surf Avenue from Nathan's, success was assured. "Nathan Handwerker's two grandsons sold their interest in the company in 1987 and, 'In 1993, Nathan's really started growing from a strictly local operation with about a dozen restaurants,' said Norbitz." Editor's note: There are certain inaccuracies in the foregoing account by Sinisi. 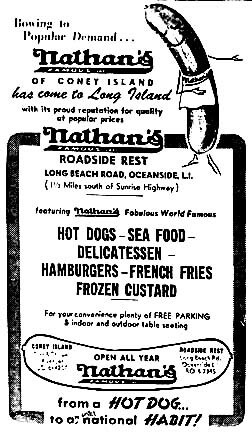 As documented conclusively above (with the Newsday ad from opening day), Nathan's took over the Oceanside Roadside Rest on June 4, 1959, and not in 1955. In fact, for years, 1960sailors.net was the only place on the worldwide web (including Nathan's Famous' own website) that mentions the event and still places it incorrectly in 1955. The article also states incorrectly that Nathan's Famous' recently retired CEO, Wayne Norbitz, started his career behind a Nathan's counter. In fact, he started with Wetson's, acquired by Nathan's in 1975. And Norbitz is quoted above as having said that Nathan's two grandsons sold out in 1987 when, in fact, it was Nathan's two sons, Murray and Sol, who sold out the last significant Handwerker interests. Thanks to Lloyd Handwerker, one of Nathan's grandsons (Sol's son), co-author of Famous Nathan, and director/producer of the documentary film by the same name, for straightening that out for us. One more thing: whether Eddie Cantos and Jimmy Durante actually loaned Nathan $300 in "seed money" is debatable. 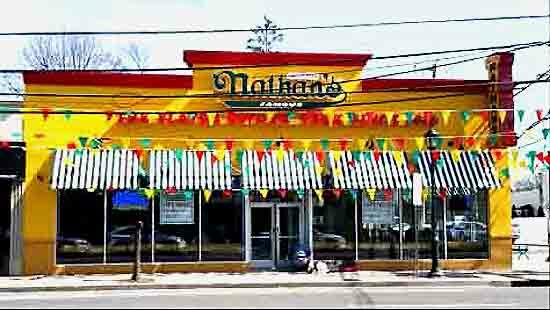 Nathan's Famous, Inc. says it obtained its third location in 1965 when it took over the well-known Adventurers' Inn in Yonkers, NY. This appears to be correct. In 1966, when it celebrated its 60th anniversary, it still had only three locations (Brooklyn, Oceanside and Yonkers), as shown on the commemorative drinking glass pictured above on the right. 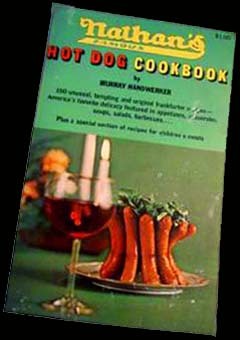 Further, Murray Handwerker's 1968 book, Nathan's Famous Hot Dog Cookbook (right), refers to only these three locations as follows: "From its main base in Coney Island or from its units in Oceanside, L.I., and Yonkers, N.Y., Nathan's air-expresses its products to hot dog and salami lovers the world over." 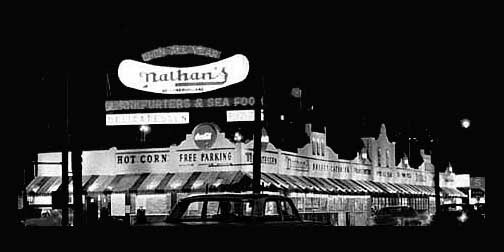 In fact, according to Nathan's Famous, Inc.., its only branch units continued to be Oceanside and Yonkers until it opened its fourth location in Times Square with the proceeds of its first public securities offering in 1970. Some folks incorrectly think Nathan's Famous had a Manhattan location at that time. 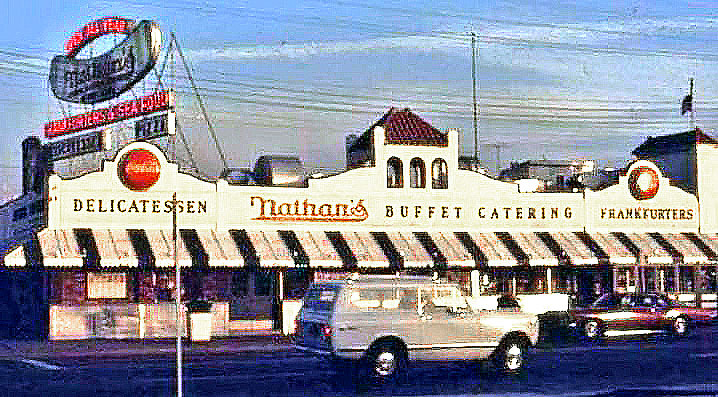 However, according to Bob Levine (OHS '63) (who worked at our Nathan's for five years beginning in the early '60s), and as later confirmed by Lloyd Handwerker, this may likely be because Murray's younger brother, Sol, (Lloyd's father) opened "Snacktime – Featuring Nathan's Frankfurters" in the mid-'60s on 34th Street across from Penn Station. Nathan's franks, burgers, and fries were available there, and accordingly, the Nathan's name appeared all over Snacktime, although it was not a Nathan's Famous location.